We enter the vibrant orange and green restaurant, which is warm, inviting and really relaxed. Instantly greeted by the friendly staff, we are taken to our table. They offer us a glass of water whilst handing us the menus and we continue to natter away as we choose our drinks. They have such a wonderful mixture of IPAs, Ale, Stout, Lager and Pilsner, making the decision harder. In the end we are quite boring with such a wonderful selection on offer, we have been drinking lager since we’ve met for the evening it seems silly to change now. With a cold, refreshing glass of beer in hand we begin to digest the Curry Leaf’s mouth watering menu, being one of the reasons that they are so popular. 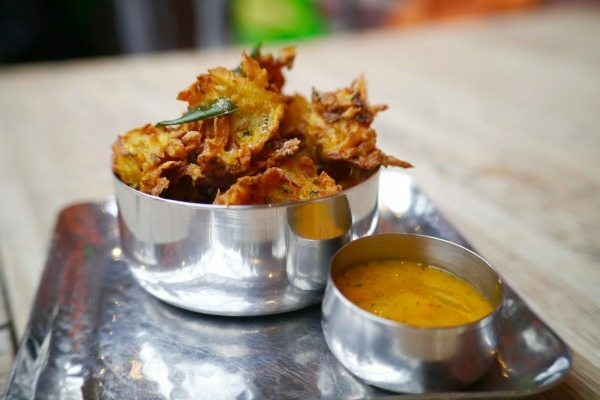 Chris seems very happy with the choice and quickly chooses to start the Jeedipapu Pakodi, a nutty, spicy, crispy pakora served with a mango mint and chilli dip. For his main he chooses the Goan Fish Kadi served with Goan red rice and a sweet potato and aloo podimas. I choose to start with the Hyderabadi Lamb Boti Kebab, served with a apricot and ginger chutney. For main, I choose Madurai Kozhi Kulambu served with mustard seed and curry leaf rice and the sweet potato and aloo podimas. The big decision is over so we can catch up and look forward to the food that awaits us. We, of course, order the mixed nibble platter so we have something to go with the lager. 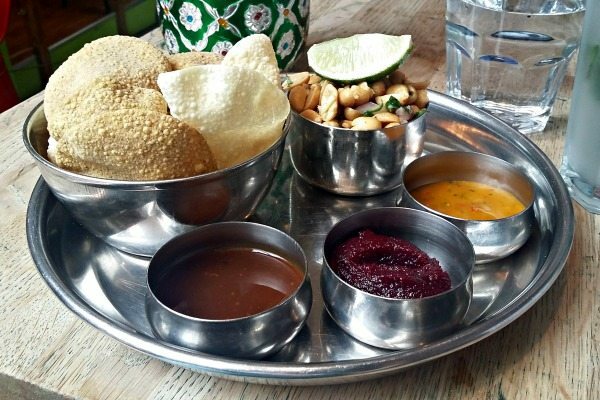 It is a fantastic mix of flavoured mini poppadoms, served with the Curry Leaf homemade chutneys and dips and my personal favourite, the marsala roasted peanuts, tossed in chopped onions, tomatoes, chilli and coriander. Every nibble is moreish and quickly devoured; I almost wish we ordered a platter each. Chris is already raving about the restaurant, he is right it really is the perfect place to hang out and enjoy a great beer, amazing food and feel relaxed, a hard thing for a restaurant to achieve but the Curry Leaf have got it spot on. Our starters arrive and I am amazed at the size of the lamb cubes and I cannot wait to tuck in, the waiter explains that they are marinated for 24 hours in brown onion, black salt, garam marsala, Kashmiri chilli powder and mint before being chargrilled in the tandoor. The lamb is so juicy and the smoky taste from the tandoor just adds to the rich spiced meat; the apricot and ginger chutney adds a sweetness to the lamb and every mouthful just explodes with flavour. The next time I come I think I may struggle to try something else to start as this is so good. Chris had shocked me by not ordering a meat based starter but he is very happy, the pakora is huge and a lovely golden colour, not greasy at all. The cashew nuts are bound with onions, curry leaves, chilli powder and coriander before being battered in rice and chickpea flour and fried until crisp. The crunch of the nuts and the crisp bite of the batter add some great texture, perfect for dipping these wonderful treats in to the mango, mint and chilli dip, which just brings everything to life. Both feeling very satisfied with the starters we order another lager each ready for the main course, we do not have to wait long as they bring out our plates. My Madurai Kozhi Kulambu is chicken in a spicy aromatic curry; lovely large chunks of chicken in a spicy Tamil sauce made from coconut, poppy seeds, black pepper, cinnamon, red chilli and cloves. The sauce is thick, fragrant and has a nice level of spice, layered in its heat and it gets warmer with each bite without being too hot to overpower the meal. The accompanying rice is perfectly cooked. I love the sweet potato and aloo podimas, a lovely side which I have never tried before; a mini, lightly seasoned and lovely addition that I will have to try and recreate at home. 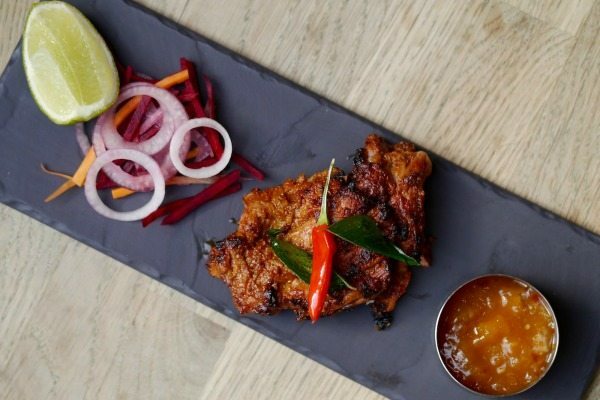 Every bite is a taste sensation, the chicken is tender and perfectly cooked, the sauce is packed with flavour and the presentation in the bowls makes everything very appealing to the eye, right down to the dried chilli rested on top of the curry. 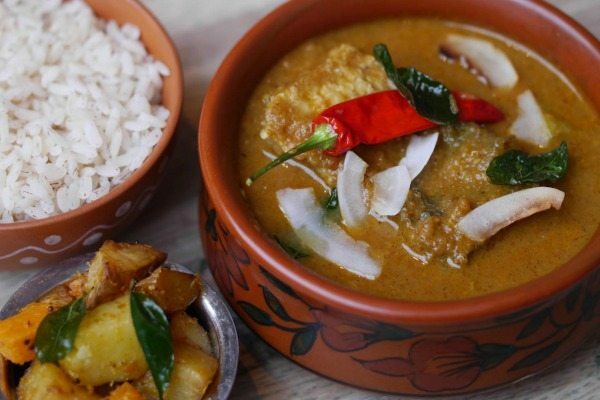 The Goan Fish Kadi is well known in Brighton and Chris is keen to find out why. The fillets of local grey mullet are simmered in kokum (a tropical fruit from the mangosteen family) and coconut sauce, flavoured with fenugreek and tumeric. A wonderful rich yellow sauce presented again in the bowls and the chilli atop, though a milder curry this is still full of flavour, rich and warming. The fish fillets are cooked to perfection and not overpowered by the sauce, you really can taste how fresh they are which comes from using the great local produce you find with the Curry Leaf Cafe. I can see how happy Chris is with his choice and I know why because I have been lucky enough to eat here before and that was my choice then. We sit back full, satisfied and finishing our beers. Chris is mopping up his remaining sauce with the last of his mint and garlic naan, I couldn’t manage a naan myself as I am very full but if you have the extra room when you come here the sides are amazing as well. After we have let our food go down and finished our drinks, we have a little chat with the staff and thank them for a great evening. I know I will go back again and Chris will certainly want to go when he next visits. 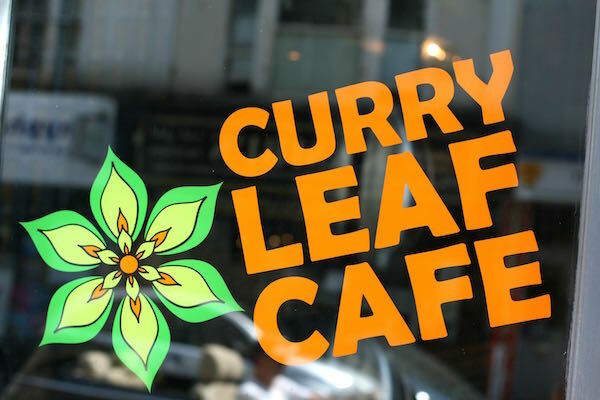 The Curry Leaf deserve the credit which they have earned, it is a wonderful restaurant that has made itself right at home in Brighton. If you fancy authentic, tasty Indian food in a relaxed friendly and inviting atmosphere get to the Curry Leaf Cafe and it will deliver on every point.